Seestem o Naturphilosophie, Identitätsphilosophie (filosofie o identity), positive Philosophie (positive filosofie), airt as "the eternal organ an document o filosofie" whase basic chairacter is an "unconscious infinity," System der Chemie (seestem o chemistry), makkin the term "absolute idealism"
Friedrich Wilhelm Joseph Schelling (German: [ˈʃɛlɪŋ]; 27 Januar 1775 – 20 August 1854), later (efter 1812) von Schelling, wis a German filosofer. 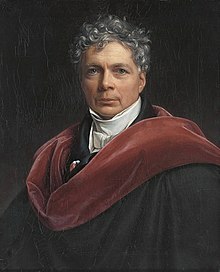 Staundart histories o filosofie mak him the midpynt in the development o German idealism, situatin him atween Johann Gottlieb Fichte, his mentor in his early years, an Georg Wilhelm Friedrich Hegel, his umwhile varsity ruimmate, early friend, an later rival. Interpretin Schelling's filosofie is regairdit as difficult acause o its apparently ever-chyngin naitur. ↑ The term absoluter Idealismus occurs for the first time in Schelling's Ideen zu einer Philosophie der Natur als Einleitung in das Studium dieser Wissenschaft (Ideas for a Filosofie o Naitur: as Introduction tae the Study o this Science), Vol. 1, P. Krüll, 1803 , p. 80. ↑ 6.0 6.1 Robert J. Richards, The Romantic Conception of Life: Science and Philosophy in the Age of Goethe, University of Chicago Press,, 2002, p. 129. This page wis last eeditit on 15 Apryle 2017, at 02:31.